Sometimes you can’t help but be angry or irritated. It just happens. Some stupid little mistake can make you blow a gasket. You just want to scream! There have been times where I have reached for that bag of chips or box of cookies when I am upset about something, but I’ve found another cure for the bad mood — kale-granola aka “kale-nola”! Cooking and baking, in general, tends to lift my spirits and transport me from bad-temper-opolis to the land of the calm. 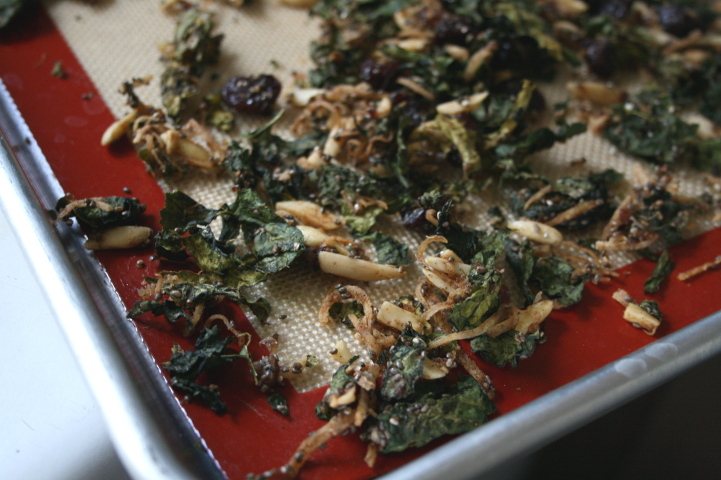 Making this kale granola was a fun experiment to reduce some stress. I used kale from the farmer’s market. I just love chatting with the people and learning more about the produce that they stand behind. I don’t like to buy kale from anywhere else. It just tastes better than those found in the supermarket, in my opinion. As for the kale-nola, you could put anything you would normally put in granola like dried fruit, nuts, coconut, cacao, whatever you want! For this batch, I went relatively simple and did a cherry chia version with slivered almonds and dried coconut. I like to use raw nuts here because I don’t want them to brown much in the oven. Speaking of moisture, the glue that holds this granola together is a dried fruit paste. In this picture, I blended some dates, but it was a bit to liquid-y. You want it to be a paste. Think thick like mortar. You want to massage the kale leaves with the other ingredients. Make sure the dried fruit mortar envelopes every little bit. Kale benefits from a gentle massage. Flavors penetrate better that way. Once everything is combined it then goes on a parchment or silpat lined baking sheet and into the oven! But…. you want to keep the oven door ajar when you bake the kale goodies so extra moisture can escape and let the leaves dry out and be crunchy. Before you know it, you’ll have some crazy green granola! It looks odd, but kind of intriguing. I love it! I really like loud and crunchy snacks. For me, it hit the spot. Addictive. Heat oven to 300 degrees F. Line two large baking sheets with parchment or silpat. Soak dried dates and dried fruit in warm water for 30 minutes or until soft. 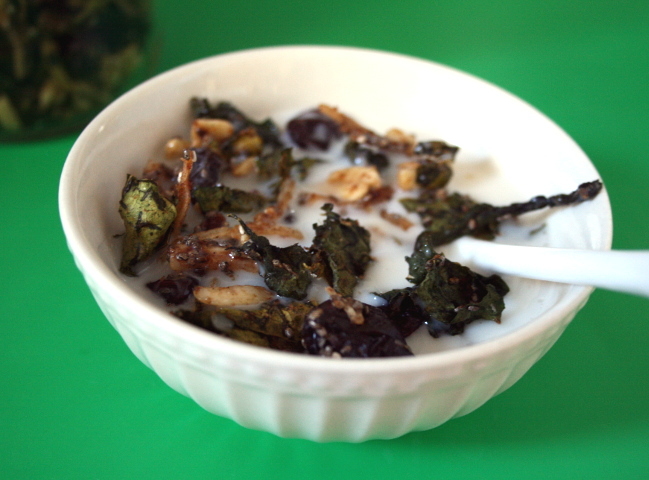 Meanwhile, in a large bowl, toss together the kale, dried cherries, slivered almonds, dried coconut, and chia seeds. In a blender or food processor, puree the softened dates and dried fruit with 1/4 cup of the soaking liquid. Add more liquid (a tablespoon at a time) to make a smooth, thick paste. Add the vanilla, lemon zest, cinnamon, and salt. Blend until thoroughly combined. Pour the date-fruit paste over the kale mixture. Massage the paste into the kale mixture until combined. Spread the massaged kale mixture over the prepared baking sheets in a single layer. 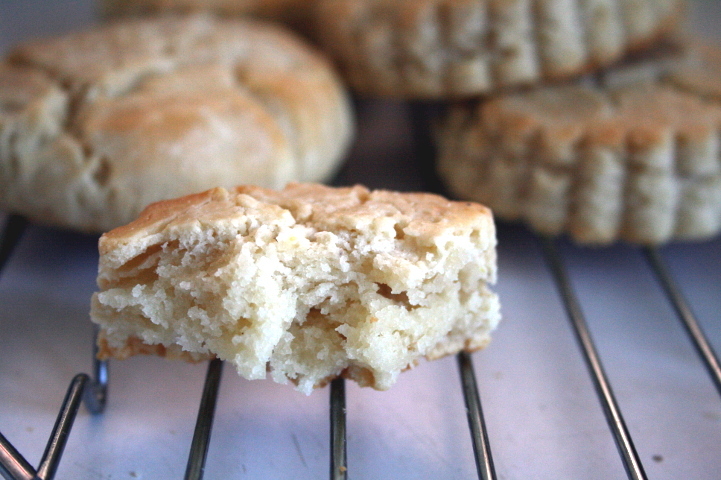 With the oven door ajar, bake for about 40 minutes until kale leaves are dry and crisp. Check often especially towards the 40 minute mark as it may brown quickly. This entry was posted in Baking, Breakfast, Cooking, Food, Gluten-Free, Snacks and tagged Dried fruit, famer's market, Granola, kale, kale chips, kale granola. Bookmark the permalink. Wow Samantha! What a great idea! Thanks! 🙂 Very yummy, even some people who don’t like kale thought so. what about using other greens? like spinach? I would NEVER have thought of this though I have made kale chips before and they were awesome. This looks like a great idea!